Ice Cream is a comfort food loved by many of our friends, but once you try homemade ice cream, it’s hard to go back. 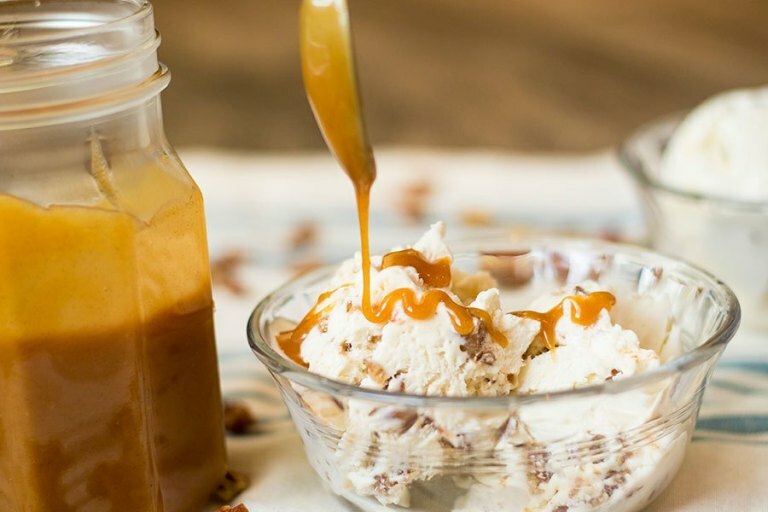 How do I store No-Churn Ice Cream? The answer to this is a lot more simple than you think! All you have to do is store it in a freezer. (Simple, right?!) We like storing our ice cream in a loaf pan, pie pan, or a freezer safe container. As far as how long it last, we recommend eating it within 2 weeks. You’ll be shocked if it lasts that long! As much as we love this Cinnamon Butter Pecan flavor combo, we would be lying if we said it was the only one we make! There are endless flavor combinations for your family to enjoy, no matter the time of year. All of these flavors will have 2 cups heavy cream + 14 oz can of sweetened condensed milk, in addition to the add ins. Cookies and Cream Ice Cream. Simply crush 20 Oreo Cookies and mix in with your base. Coffee Ice Cream. Mix in 5-7 tsp prepared coffee and 1 tsp Vanilla (#6919). Vanilla (#6919), and 1/2 cup crushed Heath Bars. You can also add 1/2 cup crushed pretzels (#2319) for an extra crunch. Fresh Blackberry Ice Cream. You will need: 4 cups blackberries (#1221), 1/2 cup sugar (#1632), 1/2 tsp lemon juice, and 2 tsp Vanilla (#6919). Ice Cream is a comfort food loved by many of our friends, but once you try homemade ice cream, it’s hard to go back. No churn ice cream is the way to go, and you can adapt for any flavor combination you want! In a large bowl, whip the cream until holding stiff peaks. Gently fold in sweetened condensed milk and vanilla, until well combined. Try not to knock too much air out of the whipped cream. In a skillet, mix pecans with Cinnamon Honey Butter over medium heat. Toast for 3-5 minutes. Don’t let them burn! Allow nuts to cool completely, then add to the ice cream mixture. Fold to combine. Pour mixture into a deep bread pan and cover with foil. Freeze 6-8 hours, or overnight. Serve with additional pecans or caramel sauce.